​Nestling under historic Vinegar Hill, with spectacular views over the town of Enniscorthy and the rich Wexford farmland, Coláiste Bríde occupies an enviable location. Established in 1970, and christened by Sr. Rosari Hahessy, the first principal, the school plays a vital role in the life of the town. 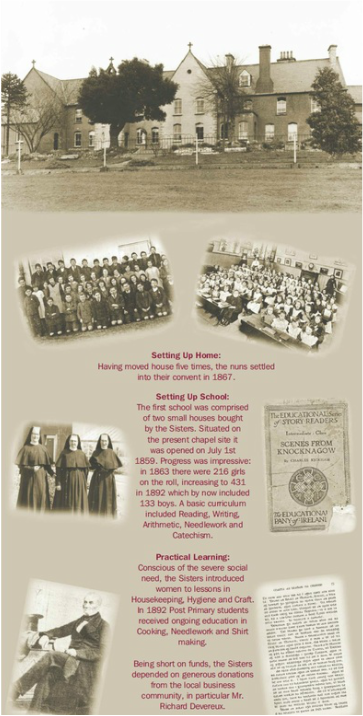 After the departure of the Mercy Sisters in 2011, we became conscious that our students had little or no knowledge of the history and rich tapestry of the schools past, a school that was started originally in 1858 by Mother Theresa Kelly who arrived into a town haunted by recent memories of famine and war. The Sisters of Mercy, with meagre finds and depending on donations from local businesses set about the task of educating the young people of Enniscorthy, starting with a basic curriculum that included reading, writing, arithmetic and catechism. Our 21st century computer literate students were amazed to discover that some of our past pupils used only pencils to write with, so that when the copy was finished, all the text could be erased and the book re-used!! 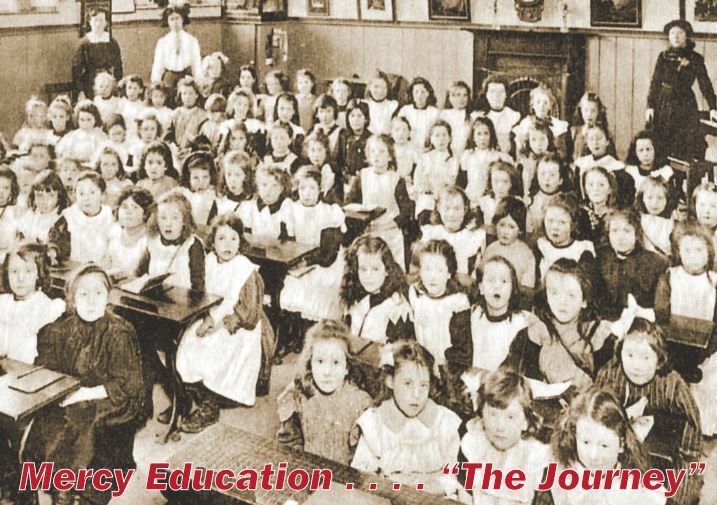 Delving into the archives of our school we realised what remarkable women spearheaded, against all the odds, the education in the town…… The commitment to house a museum that would honour the dedication of the Mercy Sisters eventually led to “Mercy Education…..The Journey” launched on September 24th 2015. Being “Mercy Day”, the 24th seemed to be an ideal day to officially unveil our exhibition. The afternoon began with the opening of the year mass during which we welcomed our incoming first years. After the liturgy, which was attended by Bishop Denis Brennan we adjourned to the school library and there, along with invited guests, including our oldest past pupil, our Mercy Sisters and a representation from our school body, we held a short, but thought-provoking ceremony. We listened to Bishop Brennan’s memories of his time as chaplain in our school, revisited the Ceist chapter and paid tribute to the Mercy Sisters. The display “Mercy Education …….The Journey” was launched with the symbolic lighting of the Ceist Candle. The exhibition is on permanent display in Coláiste Bríde, Enniscorthy. The school will be forever grateful to staff members Miriam Curtis and Stephanie Breen for the enormous amount of time and effort that they have given to bring this exhibition about.